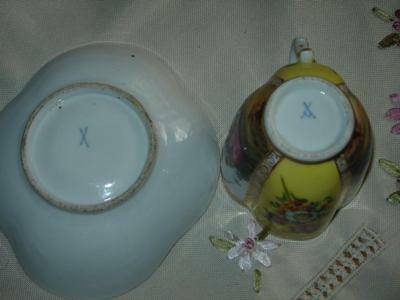 Origin of a nice fluted tea set showing crossed swords with one hilt or a 'Y' shape:- Hi, I purchased this hand painted tea set at a antique mall in Mason, Mi. 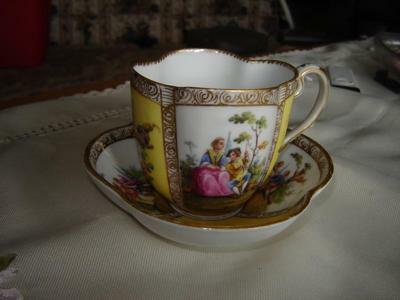 It caught my eye because of the fluted style of the cup and saucer. On closer inspection it was noted that it is also completely hand painted. The decoration is on four panels, alternating yellow and plain bordered with gold filigree. The yellow panels are decorated with a bouquet of flowers, each of which is unique. Each of the unpainted panels is decorated with a man and maid in a garden in various poses suggestive of a courtship. Again each of the scenes are unique. However there are similarities in the backgrounds. Each piece features two garden scenes. In one garden scene there is a thin wispy tree with green boughs and a gold one, a couple of blue conifers etc. and the couple are sitting on a grass covered mound of earth. The other scene features a rather thick tree with its top broken off some other random foliage and the ubiquitous grass covered hillock. On the saucer the young man is hat-less and definitely more of a hands on sort of guy. In one scene he is definitely pressing his cause in the other he has relaxed as though the prize has been one. There is obviously communication between the pair as evidenced by the eye contact and the position of the hands. The quality of the hand work on this piece seems to my untrained eye to be of a more delicate nature. On the cup, the young man is wearing a black, brimmed hat. He is in one scene sitting holding a stick with both hands. In the other he is standing playing a mandolin-like stringed instrument. There appears to be no emotional or physical connection between the figures. The workmanship details in the painting of this piece is more coarse. and minimal inclusions on the exterior. The only mark is a pair of crossed lines. When oriented above the horizontal center line the crossed lines are to the left of center. The cup has multiple flaws and inclusions on the interior and a couple of small flaws in the glaze on the exterior. The mark when oriented above the horizontal center-line consists of two lines crossing above their mid-lines, with a short line extending from the mid-point of the lower half of each of the crossed lines. These short lines approach but do not touch one another. This will be sent as a birthday gift to a dear friend in Moscow. If I could discover approximately when, where, and by whom these pieces were manufactured I would be delighted. 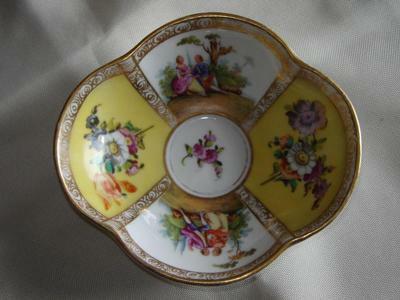 This is a hand-painted Dresden Quatrafoil set, most likely from a late 19th century Dresden hand-decorating studio. It is decorated in a panelled style of decoration known as 'Quatrefoil' - very typical of the Dresden style. This studio would not have made the porcelain blanks, but bought them from a factory specialising in porcelain manufacture. The mark is an 'homage' to nearby Meissen - kings of European porcelain. This 'Y' style of crossed mark looks a little like the crossed hayforks mark of Volkstedt-Rudolstadt, but it is not this one I don't think. There were very many different Dresden studios, all making in a similar style, some with marks recognised today and some which are not. Some were of very high quality, some less so. Only an expert would be able to make a judgement on the quality, thus giving a value estimate, and an expert may or may not be able to say which exact studio used this particular variation of the Meissen crossed swords mark. Likely not as most records were lost during the Allied bombing. To avail yourself of an expert, either talk to an auction house or click on the treasure chest photo at the top right of this page. The crossed pitchforks as mark are a hint, that this cup is decorated in Rudolstadt. "Richard Eckert & Co. AG" was using this mark at the beginning of the 20th century. In Dresden at this time, it was impossible to use such a mark under the observation of KPM Meissen. Hello and thanks again for your knowledgeable comments. I really appreciate it.